The last time Ben & Jerry's dropped an ice-cream core on this world, I rekindled my love with jam . 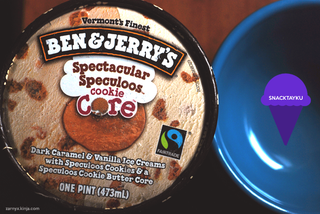 This time the wizards at the ice-cream factory in Vermont return with three more in a new line of Core flavours where "C" is for "Cookie", and that was good enough for me to visit the freezer aisles to try the: Spectacular Speculoos Cookie Core ice-cream. I was misty eyed when *SPOILERS* Taraji P. Henson's character Carter left Person of Interest for bigger and brighter things. She's certainly the bad-assed biatch as Cookie in Empire. And also on Sesame Street, apparently. In her starring contract with Ben & Jerry's line of cookie cores, she's just adorable. She's got bite. Sass. My Empire joke went on for way too long. My apologies. The truth is that the speculoos cookies in Speculoos Core are just as adorable, sassy and they have bite too. Speculoos cookies—the internet informs me—are spiced with cinnamon, ginger, cloves, white pepper, cardamon and nutmeg; and are thin, crunchy precious things. In Speculoos Core, they're definitely crunchy (but rounded) and add a wonderful texture to the creamy goodness of the ice-cream. Finding those little nuggets of joy are a delight every time. There are also little batches of cookie dough, and they offset the crunch by adding chewy, predominantly cinnamon spiced goodness. They're a welcome sweetness too because despite caramel flavoured ice-cream fulfilling a portion in Speculoos Core, its flavour is surprisingly not that sweet at all. But you know what? That's really okay. Vanilla and Caramel ice-cream go halfsies in Speculoos Core. I was expecting an overly sweet taste to that caramel side but there's barely a hint and it's mild, much like the vanilla. It does not overpower the other flavours as caramel can do sometimes. It makes the little chunks of dough more important as they add that desired sweetness and let's the speculoos sparkle like little cinnamon sugary gem bits. Otherwise, the ice-cream alone would a very bland outing. Hey. Some people like vanilla. Ain't nothing wrong with that. Except that I judge you. Not really. Not only did I open up the carton to find the balanced upset once more with a core on the side as opposed to the middle (shenanigans again! ), but the actual Speculoos butter core? There's just something off about that taste. It's intense but not in a good way and overpowers every single thing in the ice-cream. It's got a smooth texture which isn't really the problem. That silkiness is wasted because of its taste! Which I can't even describe. It's almost as if all the spices of speculoos butter were fighting the good fight (against each other) and created a travesty in a civil war. It's not really bitter, per se but it isn't exactly pleasant. It's a lump of strong flavour that takes you out of the experience of everything else living happily together. There's no delicious ice-cream to butter harmony here, and the butter core is an unwelcome fiend trying to tear the world apart. Why couldn't it just get along? I think it was supposed to taste like gingerbread but I wasn't really getting that. The caution here is maybe you'll like that core but the cool thing about it is that, since it's a core, you can just scoop it out if it doesn't work for you. Give it to your sibling, a frenemy, or something. Otherwise, enjoy the not-sweet but creamy goodness of Speculoos Core minus the Not-So-Spectacular Speculoo Butter core. Or if you like speculoos butter, then maybe this really works for you but then again, maybe just go buy a jar of it since the ice-cream doesn't actually do anything to enhance it. Or! Go forth and try the other Cookie core flavours — Boom Chocolatta! or Peanut Buttah. Or stick to That's my Jam and Karamel Sutra. Follow N. Ho Sang on Twitter at @Zarnyx if you're feeling adventurous, or you can read her articles here.